Few souls are brave enough to incorporate their favourite film or game character into the design of their home. But if you happen to love the old school arcade game Space Invaders, then you have probably been around long enough to know it's no passing fad. For those who are a little lost, Space Invaders is a classic arcade game popular in the 1980s. It was a precursor to modern video gaming and introduced the world to the addictive qualities of the genre. Over the years, the simple, clunky graphics have become sources of nostalgia for old-time fans. 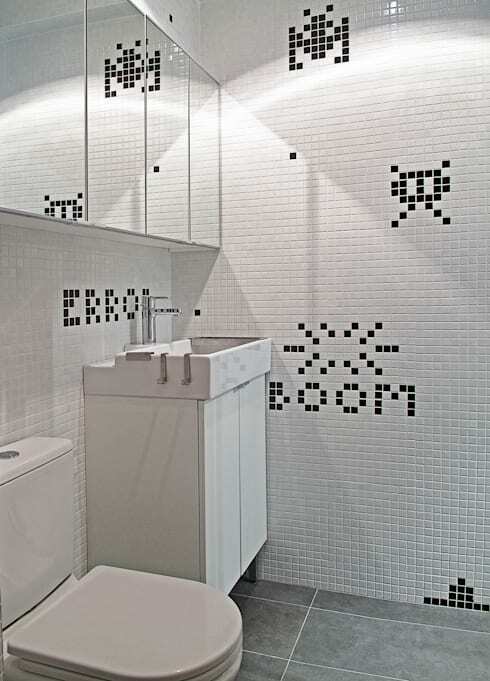 So it is no surprise that one such fan decided to create an apartment with a Space Invaders theme! The tiny 35-sqm apartment is filled with graphics from the game and has a simple feel that might remind some of the old analogue days. It is located in Hong Kong and was designed by the team at OneByNine, an architecture firm based in Hong Kong and Poland. Keep reading for all the intriguing details! The apartment may be small, but it has a prized outdoor terrace. 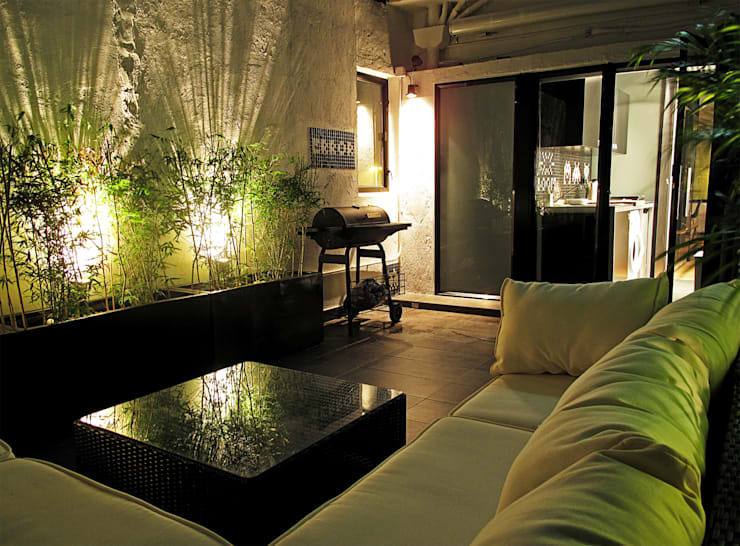 The terrace has been well furnished with a large outdoor lounge, glossy coffee table and great outdoor lighting. This adds a moody, modern feel to the outdoor area at night. Note the quirky blue and white tiles above the outdoor barbeque. They spell out the word error in the style commonly used in the old pixelated arcade game. The apartment has a long and narrow layout, so it was ideally suited to a compact galley kitchen. Here we also get a sense of the dark, glossy modern feel of the space. Everything is arranged as simple monochromatic blocks of colour and furnishings. Ahead is the hallway that leads us towards the rest of the apartment. 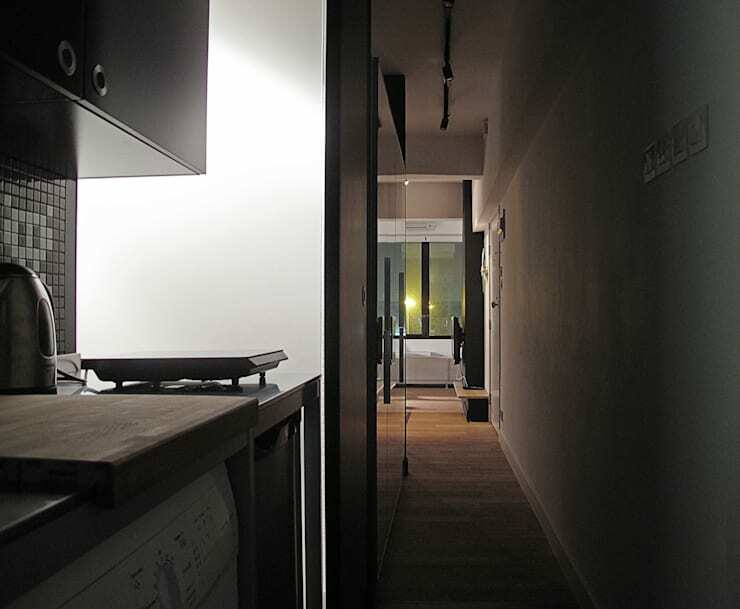 The apartment is just 35 sqm, but every metre has been utilised. Here we have a generously-sized sofa and a bedroom partition in the background. The bedroom has been separated with a sliding black door and the all black furnishings add to the cohesive, simple feel. There are no fussy or ornate details and the simple geometric lines of the monochromatic space have been allowed to dominate. If we turn right, we come to the small dining area and window. 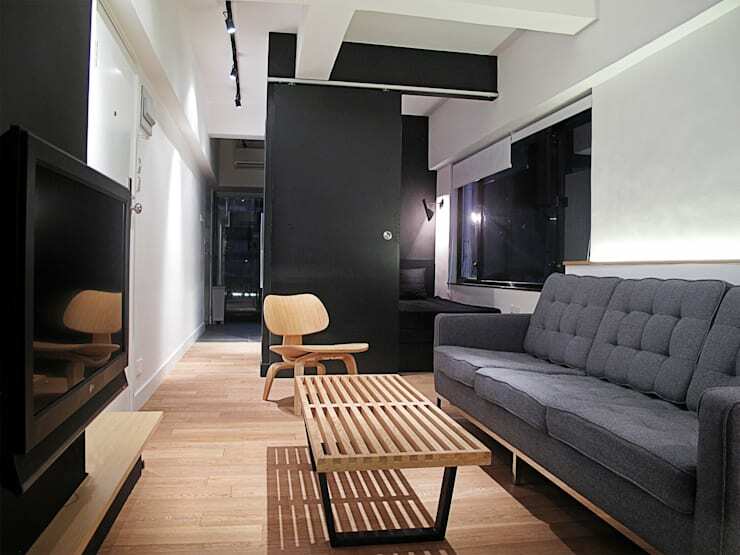 The window frames are black and the simple arrangement of furniture makes the small apartment feel spacious and comfortable. The simple geometric shapes dominate the space here too. But aside from the monochromatic colour scheme, the arcade game theme is largely absent. The very quirkiness of such themes could easily overwhelm such a small space, so the designers have used them very sparsely. This all changes, however, once we get to the bathroom! Wow, what a bathroom! 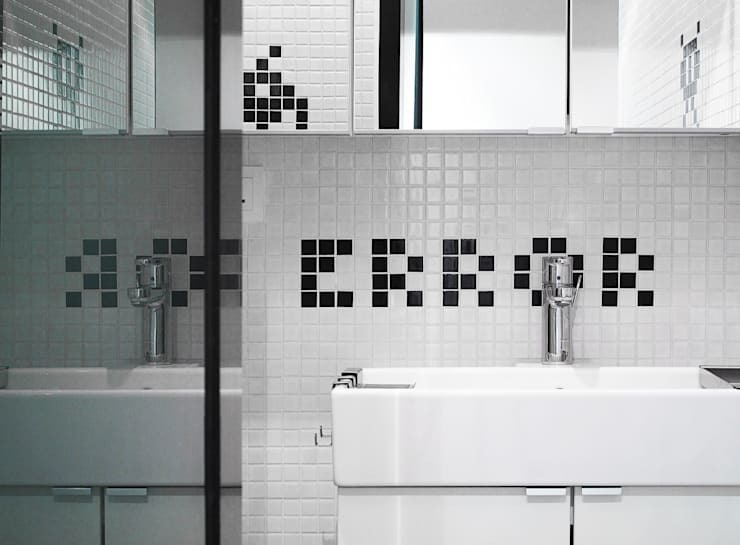 The wall tiles have been emblazoned with alien invaders, errors and even little pixelated battleships. The small bathroom has been sparsely furnished otherwise. It is small, so the walls and fixtures are white, and the bathroom mirror is generously proportioned. These are all important space-enhancing features in a compact and windowless bathroom. We will finish our tour with a close-up of the bathroom vanity and unusual tiles. Even if you are not a fan of the game, this home a good example of how an owner might incorporate their favourite theme into a home design. 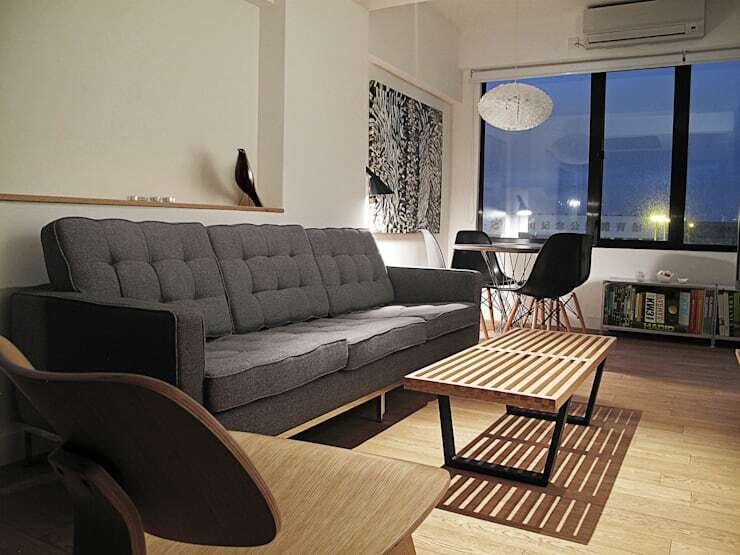 The simple theme has been expanded to determine the apartment's colour scheme, and the quirky characters have been incorporated with great pizzazz. This tiny modern apartment may not be everyone's cup of tea, but if you are a die-hard old school arcade game fanatic, it might be the perfect little abode! If you are interested in cutting-edge design, you'll love this apartment: The secret city home of glass and colour. What do you think of this quirky home? Let us know in the comments field below!